It is a testament to how strong the Alabama program is that the 2014-2015 season seemed relatively average by normal standards, even with 12 victories, an SEC Championship and a Playoff appearance. Even with those successes, the Tide easily could have lost to LSU, Arkansas and even West Virginia in the opener and were dominated by Ohio State in the Sugar Bowl, in a game that they just seemed unmotivated in. As usual, Nick Saban's program loses some incredible talent up and down their roster, but they still are widely seen as a clear cut Playoff contender. Another quarterback competition will be interesting and will obviously play a huge role for the Tide, but with their crazy talented front seven and blue chip recruits ready to fill in, Alabama is definitely going to be dangerous, and ready to return to a Championship game that has evaded them since the 2012-2013 season. missing a huge chunk of 2014-2015 with a broken leg suffered in the loss to Ole Miss. Drake ran for 112 yards and four touchdowns before the injury, and has shown more explosiveness than Henry. He is a fabulous change of pace from the bruising running of Henry. Redshirt freshman Bo Scarbrough is likely to make an impact in the backfield, likely at fullback. Scarbrough was a widely hyped recruit a year ago but the athlete just couldn't find a way to get on to the field. 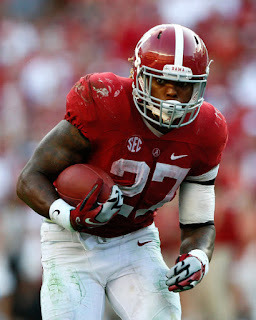 Now, he will an important role and should even get some carries and passes out of the backfield. Receivers: Amari Cooper may go down as one of the greatest Alabama players, let alone receivers, in the history of the program. In 2014, coming off a sophomore year full of injuries, Cooper exploded for insane numbers. 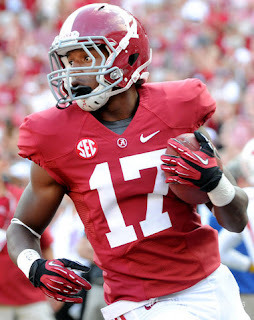 He managed 124 receptions, 1,727 yards and 16 touchdowns and finished off third in Heisman voting. That type of crazy production was enough for the Oakland Raiders to select him fourth overall, after he ditched his final year of collegiate ball. Though, it wasn't just Cooper who left this offseason; Christion Jones was an explosive presence, while DeAndrew White's 504 yards will also not be easily replaced. With those losses, Saban and Lane Kiffin will be searching for a new No. 1 target. Look no further than sophomore Robert Foster, who has dazzled in the spring and fall sessions so far, and looks primed for a giant campaign. Foster recorded just six catches for 44 yards a year ago, but his size and great leaping ability make for a dangerous red zone presence. He isn't nearly as explosive as Cooper, but he has all the tools to be dominant. Expect big things as well from junior Chris Black along with sophomore Cam Sims. Black had 15 receptions for 188 yards and proved to be a reliable complement to the other talent that Alabama possessed. Sims is another sophomore breakout possibility, along with so many others thrown into increased roles. Sims is a blazing quick playmaker, who could take over as the Tide's top deep threat. With an offense that will run between the tackles early and often, having a speedster like Sims to make plays down the field is critical. Sophomore ArDarius Stewart is another explosive weapon who should see a major increase in targets, and newcomer Calvin Ridley has high expectations. Ridley is a sure-handed weapon who is rated as the top receiver in the Class of 2015 by 247 Sports. Despite not being the biggest receiver, Ridley is an established route runner who finds ways to change the game. Fellow true freshman like Daylon Charlot, a four-star from Louisiana, along with tight end Hale Hentges will hope to impress enough to see action in their first seasons with the Tide. Even with that talent at receiver (though unproven talent) the top pass catcher on the entire roster may be none other than junior tight end O.J. Howard. Howard had high expectations entering his sophomore season but slumped early. Though, he found his stride and managed a productive year, with 17 receptions for 260 yards. He is a matchup nightmare for opposing defenses; at 6'6", 242 yards his size is imposing, but he is quick and can make plays down the field. He is already among the conference's top tight ends and should get even better in 2015. Joining him at the position will be senior TY Flournoy-Smith, who fills in for the graduated Brian Vogler. Vogler was never a receiving threat, but he was a tremendous blocker, a role that Flournoy-Smith will now have to fill. Offensive Line: Alabama has become one of the top programs in college football because of many things but perhaps most important has been their amazing offensive lines, which are always filled to the brim with future NFL studs. That should not change one bit in 2015, as the unit should be very strong, and has a number of linemen that have pro scouts very excited. Left tackle Cam Robinson is already among the best offensive linemen in all of college football, despite entering just his true sophomore season. Thrown into the toughest conference in college football as a true freshman, Robinson performed very well and he should get only better in his second season with the Crimson Tide. Robinson has the size and athleticism that makes pro scouts very impressed, and he would be a pretty high draft pick if he came out right now (though he still has at least two more years left in Alabama, per NCAA-NFL rules). Senior center Ryan Kelly is an important returnee as well. He might not have the potential of Robinson or some of the other pieces on the offensive line, but he is an anchor to the unit who has plenty of experience in the physical play of the SEC. Having a center like him will help whoever the new quarterback is, and he should keep some of the SEC's top interior pass rushers at bay. The rest of the unit isn't as experienced, but there is some impressive talent there, beginning with senior right tackle Dominick Jackson, who should be in store for a very big season. Jackson has great size and decent mobility, and he knows the system, considering how long he has been involved with it. Joining Jackson on the right side of the line should be redshirt freshman Ross Pierschbacher, who apparently was a great practice guy in his redshirt. Certainly making the move to the big time play of the SEC will be an adjustment, but all the talent is there for the young guard. He will be challenged by sophomore Bradley Bozeman, a productive, powerful option, who also can play center. Rounding out the unit as a whole, should be left guard Alphonse Taylor, a junior with plenty of upside. Taylor has continued to work on his mobility, but the 330-pound guard certainly won't be easy to get past either way. Junior Brandon Greene should look for snaps at either tackle positions, or even in some trick plays. The veteran had a funny moment a year ago, bringing in a crazy, 24-yard reception that went for six and helped fuel Alabama to a thrilling victory against LSU. Expect a couple newcomers to see action on the offensive line, especially a couple interior linemen. Brandon Kennedy is a pipeline pickup who has the potential to be a dominant run blocker, while four-star guard Lester Cotton is already 330 pounds and should bulk up even more in his first year with the Tide. Defensive Line: The Crimson Tide may have the nation's top front seven, and it all begins with their gigantic defensive line. Junior A'Shawn Robinson is widely seen as one of the country's top defensive linemen, and he should get only better with another year of SEC football under his belt. The 6'4", 315-pound nose tackle not only has the size to be dominant at that position; but he has the athleticism, versatility and quickness to play across the defensive line. Robinson had 49 tackles and 6.5 tackles for loss a season ago, and should compete for not just All-SEC honors but also All-American honors as well. He is supported on the line by junior Jonathan Allen, who is the top returning sacks leader, after posting 5.5 a year ago. Allen isn't the explosive or most powerful, but he is a grind-it-out type player with a high motor. He also had 11.5 tackles for loss and proved to be a very good run defender in 2014-2015. On the opposite defensive end spot, expect big things from senior Jarran Reed. Reed proved to also be a terrific and productive end throughout last season, recording 55 tackles with 6.5 of them going for a loss. He isn't quite the pass rusher that Allen is but he is a great athlete who covers a vast range for his position. With offensive lines focusing so much on Robinson, Reed and Allen should get plenty of opportunities, and expect defensive coordinator Kirby Smart do dial up some impressive blitz schemes to get pressure on opposing quarterbacks. Senior D.J. Pettway is going to put together a big year, even though he is most likely a backup end at this moment. Arriving in Alabama for his first year removed from junior college, Pettway proved to be solid, with 23 tackles and two sacks as a reserve. He did that still learning the ropes of big time, FBS football and he should get even better in his second year in Tuscloosca. Pettway has an explosive first step and can often overpower linemen. Even with all that talent, the most likely breakout star of the unit has to be sophomore Da'Shawn Hand. Hand was widely seen as a five-star prospect a season ago, and showed flashes of stardom, with two sacks despite being very low on the depth chart. Hand has the frame and speed to the ball to be very good, and is yet another popular name in NFL Draft circles despite being so young. He should take huge steps this season, and could rack up sacks, even if he isn't starting. Not surprisingly, there are a number of true freshman with loads of talent coming into the group, and it will be interesting to see if any of them get any action. Among them is going to be four-star defensive tackle Da'Ron Payne, a bulldozing linemen from Birmingham who weighs in at nearly 350 pounds. Defensive end Christian Bell also arrives from the city of Birmingham, and could possibly bring depth, if he doesn't receive a redshirt. Another newcomer who could be primed for playing time has to be JUCO find Jonathan Taylor. Rated as a four-star pickup, Taylor was a man among boys at Copiah-Lincoln Community College. He could prove to be a very solid tackle for Saban and Smart. Linebackers: High quality linebackers have long been a staple of the Nick Saban era with the Tide, and that shouldn't change one bit in 2015. Such talents as Rolando McClain, C.J. Mosley and Trey DePriest, this past year, have played a key role in the 'Bama defense. DePriest is now gone, leaving the role of the leader of the defense most likely to senior Reggie Ragland. Ragland was second on the top in stops a season ago, managing 95 while also having 10.5 tackles for loss. Ragland has incredible instincts and has the athleticism and smarts to get to a spot and make the play; he doesn't make much mistakes. The veteran should put up big numbers in what will be his final year with the Tide. Junior Rueben Foster is primed for a big year, and should join Ragland in the inside. Foster is yet another high profile recruit who will finally get his time to shine. Foster has shown plenty of hit power and playmaking potential in his first few years with 'Bama, but all as a backup. He should explode for big numbers with the opportunities now. Senior Dillon Lee also returns to the linebacker corps in the middle. Lee is a terrific run defender who was productive a year ago, with 24 tackles. The Tide will hope to see big things from their outside linebackers, particularly senior Denzel Devall. Devall hasn't seen much opportunities in his time with Alabama, but has looked good in spring and in fall camp, and he could turn into a strong pass rusher. He is a sturdy, but yet quick linebacker with impressive range. Sophomore Rashaan Evans could push him, or even start a the other outside linebacker spot. A player who seemed destined for archrival Auburn but instead decided to head to Alabama, Evans has loads of potential. He is an incredible athlete with good size who offers the versatility to help in run support or coverage. He is still very young and raw, but by midseason, he could be a star. Junior Ryan Anderson is the more likely candidate to start at the other outside linebacker spot; a well-rounded linebacker with a high football IQ. Anderson also showed that he could be a pretty good pass rusher, with eight tackles for loss and three sacks last season. In terms of recruiting, a young crop of linebackers will fight for playing time in a veteran laden unit. Adonis Thomas is a four-star find from Georgia with all the intangibles of a productive linebacker in the SEC, while fellow Georgia prospect Mekhi Brown brings plenty of potential down the line himself. Secondary: With the talent in the front seven, teams will not have a very easy going trying to run the ball against the Crimson Tide. Though, with the experience and talent that also returns in this secondary, it isn't like teams will have a field day passing the football either. The Tide are stacked at the cornerback spot, with the returns of junior Eddie Jackson and Cyrus Jones, two of the better in the conference. Neither will jump out at you too much on the stat sheet, but both are disciplined veterans who are great in man coverage. Jones recorded 46 tackles, three interceptions and 13 pass deflections a season ago, and is a fearless defensive back. Despite not being very big, Jones is never afraid to take on some of the big play targets that roam the Southeast, and he usually has success against them. Jackson is a talented corner who showed signs of becoming an absolute stud in what was really his first season with increased snaps. Jackson is a well-built cornerback who uses his physicality and toughness to shut down opposing receivers. Jackson put together a very good all-around 2014 campaign, with 41 tackles, one pick, six pass deflections and two forced fumbles. Smart will continue to ask him to not only obviously play a key role in coverage, but continue to be aggressive and he could be used in different blitzes. Behind those two veterans, sophomore Tony Brown and redshirt freshman Marlon Humphrey are the assumed backups. Both are big name recruits who are still finding their way in college football. Brown had just 10 tackles a season ago, but has looked wonderful in practice and should continue to work his way on to the field. The gem of this year's recruiting cycle, Kendal Sheffield, also could see some limited action at corner. The five-star prospect arrives from Missouri City, Texas with tons of hype. The free safety position should be a strength, with senior Geno Smith. Smith should be happy to get back to the football field after a tumultuous offseason. Smith was arrested for his second DUI charge in March and there was a widespread belief that he might be dismissed from the team. Though, Smith returns and while his off-the-field life has been a question mark, there is no denying what he can bring while on the field. The sturdy veteran had 56 tackles in 2014-2015, with 3.5 going for a loss. Smith is a tough and gritty football player and he should once more put up good numbers. Landon Collins is gone at strong safety, leaving a huge hole. Collins was among the best defensive backs in the nation, with 103 tackles and three interceptions to show for it. He is now off to the NFL, meaning that sophomore Hootie Jones is the favorite to assume his role. Jones is an incredibly quick safety and certainly doesn't lack in size either. Though, it will still be incredibly tough to replicate Collins' ball hawking abilities and his proven production. Special Teams: For all the talent that Nick Saban has assembled in his time in Alabama, there has been one glaring weakness: kicker. Junior Adam Griffith had a rocky 2014-2015, but is still the assumed starter, after going 12 for 19 on field goals. The good news is that sophomore J.K. Scott is as good as they come and a number of playmakers are back in the return game. Few teams in college football can match the talent that resides up and down the Alabama roster. That is why, despite the losses of Cooper, Yeldon, Sims, Collins and more, this Tide team is still expected to make a Playoff run. Though, the quarterback situation is a major mystery and one-dimensional teams become very exposed in big games. And, 'Bama has quite a lot of big games, beginning with that Wisconsin matchup in early September in Dallas. 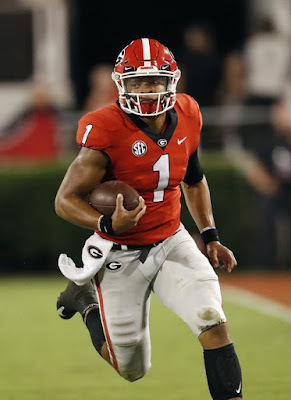 Statistically speaking, their SOS is the nation's toughest and they get no off weeks in a brutal October that includes trips to dangerous Texas A&M and Georgia between the hedges. But, who am I to count against Nick Saban and the mighty Crimson Tide? 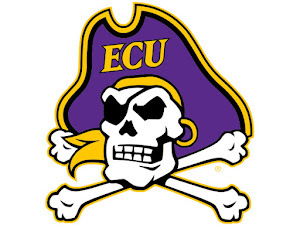 A 58-9 mark, two national and conference championship titles in the past five years say something and this team should be hungrier following a disappointing (by Alabama standards) 2014-2015. After owning the end of the BCS era, Alabama still has to prove that they are the team to beat in the new Playoff era, and they certainly could this season.